Everything is Facebook in the future! So today is the big day when all the PS4 reviews are coming out and just as I expected from the Kotaku review it got a resounding "Not Yet." Really what more was there to expect? The new hardware is cool but most of the titles are updated ports of last gen games so there isn't much to really compare other than if it looks nicer. While the almighty journalists have been enjoying the PS4 for the past few days the rest of us can get our plebeian hands on it this Friday while the Xbox One comes out the Friday after. Just about every generation of video games is known for something big that happened, Last-gen will be remembered as the one where online gaming became king and video games more or less became mainstream. The gen-before that planted those seeds, the one before brought 3D graphics to the world, and so on. But I'm curious about what this gen will bring to the table. The games will certainly look nicer but that I doubt that will be the major spark of this gen. So that leaves the other big name feature of the XBO, PS4, and less significantly the Wii U... Social Networking. Don't quote me on this but Social Networking did exist in its infancy back when the last-gen first started. When the PS3, Xbox, and Wii, came on the scene though they were more or less straight gaming machines that could also play DVD/Blu-Rays if you wanted to. Now fast forward a few years. Everyone has an iPhone, Twitter, Facebook, Netflix, and so on. Your Xbox now has limited Facebook and Skype functionality. Netflix can be streamed from your computer, to your Playstation, to your toaster, and everything in between. The consoles of last gen didnt have social networking in mind when they were first developed but they sure tried to jump on the wave as it passed. This time around though Social Networking is one of if not the main features of our new consoles. 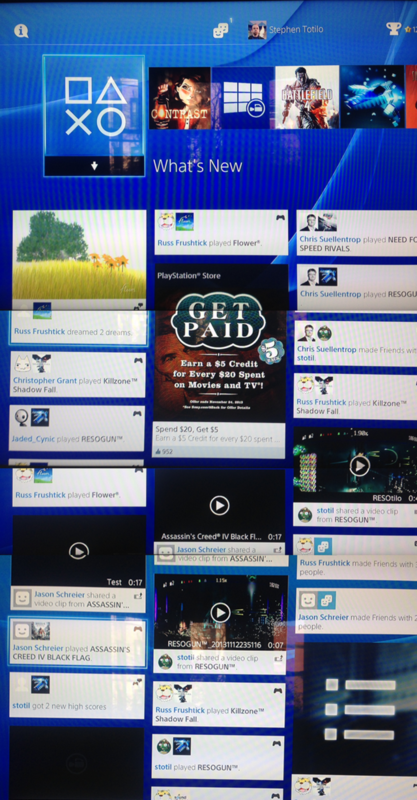 Send pictures, videos, invites, likes, recommendations, right from your controller without ever needing to leave the game. Go check your fantasy stats/stocks/weather/friends status all while driving your virtual car. Hell, you can watch movie trailers WHILE you watch a movie. Now we even have apps for our smartphones so we can see what games our friends are playing even when we aren't at home. I can't tell if I'm looking at the PS4 home screen or my Facebook feed anymore. Is this what the future holds in store for us? If so I don't like it one bit. Perhaps I'm just being cynical. I'm not exactly the biggest fan or social networking and am definitely not the target audience for most of these new features. I like the built in-recording features but not much else beyond that. I know there are a lot of people out there who do enjoy tweeting every other minute and seem to have a biological need to know what their friends are doing at all times and I'm sure they'll get a kick out of the new systems but where is the big new feature for those of us who don't care about that stuff? I won't be getting a PS4 or Xbox One anytime soon. Perhaps in a year or so when they pick up some games or the old systems are phased out I'll hop on the next-gen ship but for now I don't particularly care for the shiny new functions of the next gen systems. What say you? Are you excited about all the social networking in these consoles? Is your vision of the future different from mine? Will you be picking up a new system at launch? Let me know. CreaTAYve Rambling is a semi-regular (as in whenever I feel like it) article I put together where I just ramble on about what I feel like. I make no guarantees of coherence or grammatical correctness. Be sure to leave a comment below and like and subscribe and recommend and upvote and retweet and so on.